Freshen up your bedroom with the enchanting style of Intelligent Design's Khloe Metallic Printed Reversible Coverlet Set. 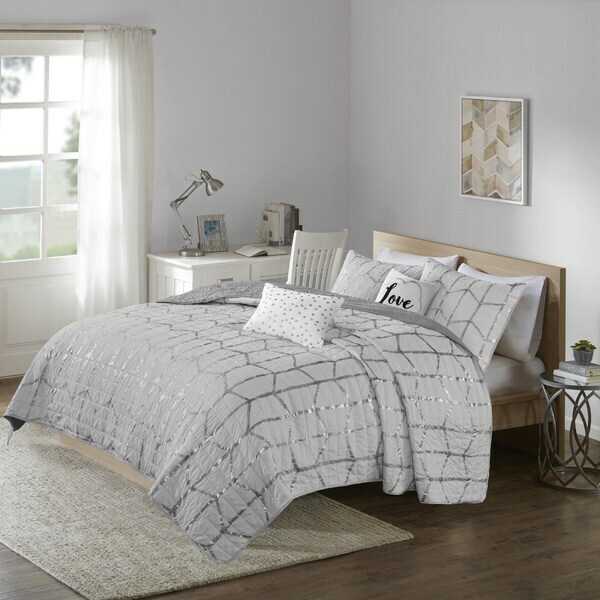 The stunning quilted coverlet flaunts a geometric, metallic silver print against a soft grey ground for a fun and eye-catching look, while a grey reverse complements the modern print on the top of bed. A cotton-rich filling provides exceptional warmth and comfort, while the prewashed fabric creates an extra soft feel. Matching sham(s) echo the design seen on top of the bed to pull the entire ensemble together. Two embroidered decorative pillows with typography and metallic details complete this fabulous, ultra-soft microfiber coverlet set. Dimensions 90.0 In. X 68.0 In. X 0.25 In. Wonderful coverlet. Perfect weight for Florida nights. Love the softness. Washes great. Very, very pleased with purchase. Bought this for my 11 year old and she loves it. Added other pillows, etc. "What is the difference between a coverage and quilt?" A coverlet is a lightweight, non-reversible bedspread that is usually either quilted or woven. Classically designed as a decorative layer to go over thicker bedspreads, coverlets often have a thin layer of batting, making them appropriate for use as a stand-alone bed covering, depending on the weight.